If there is one good test of a show’s artistic success it could be this: after watching the first episode of Nowhere Boys, I just wanted to watch the second straight away. And I’m not even in the target demographic. ABC3’s new teen drama from Matchbox Pictures trades off a simple, but evocative, premise. The fact that it is so well produced and performed is just the icing on the cake. Four boys who would never be friends at high school are grouped together during a school excursion on a forest trek. But they wander off course and eerie weather disorients them. When they eventually emerge the next day, nobody back home remembers them and it’s as if they never existed. With a bigger budget and a more adult classification, that’s probably the kind of synopsis you might read for a Hollywood popcorn flick. But here it finds a home in outer suburbia with almost as much intrigue. Cleverly, the four boys represent different archetypes. Matt Testro plays Jake, a boy with plenty of bravado to compensate for a broken home. Jake lives with his single-mum Kathy (Libby Tanner) and both persevere despite his apology of a father (Damien Richardson) knocking at the door. By contrast Rahart Sadiqzai plays Sam, whose life is near perfect, with the adjusted, happy family and the popular girlfriend. Joel Lok is Andy, the geeky boy of Singaporean descent who lives in a household of three generations of women. He’s smart but a social outcast. Lastly Dougie Baldwin plays cynical goth Felix, who dresses for individuality and with a hint of rebellion. But at home his younger brother is disabled, giving him a shy empathy. When the four are grouped together by their teacher in the middle of a forest, none are particularly happy about it. But the sooner they get their trek over with the sooner they can all resume their own lives. At least that’s the theory. The forest setting adds to the supernatural element with moody music and a dark, spectre-like character played by Michala Banas, who follows them from a distance. CGI creates a weather change that threatens their survival and opens our imagination for what is to come. When they make their way home to the sleepy, fringe suburb of Bremin it’s a bit like Michael J. Fox in Back to the Future: families are still there but relationships have altered and nobody knows who they are. If they are to solve this mystery, these boys will need each other more than ever. Creator Tony Ayres makes these four very believable for a contemporary audience. Without overplaying the subtle themes of team camaraderie, writer Roger Monk peppers his script with sarcastic teen dialogue and humour. A handful of colourful adult roles help us side with our central characters. The four young actors are universally excellent, juggling suspense, drama, humour, self-esteem and a dash of action. Joel Lok makes the most of comedic material, Matt Testro adds depth to a character dealing with complex issues, Dougie Baldwin demonstrates his character is more than his outer shell, and Rahart Sadiqzai will be one to watch. Director Daina Reid ensures Nowhere Boys is an effortless watch, played straight and without ever patronising the audience. After a number of female-skewed projects (Dance Academy, Dead Gorgeous), it’s great to see a fully-fledged ABC3 production with male leads. 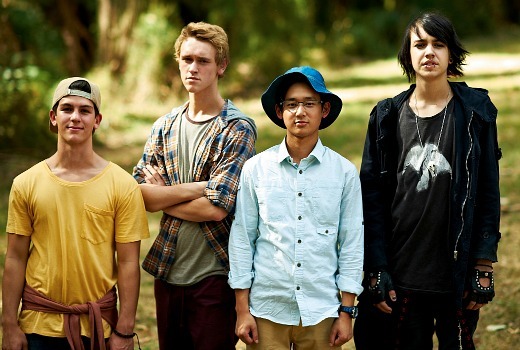 Nowhere Boys hits its mark from the outset with a clever mix of drama and mystery. And after Episode 2 I was just about tempted to watch the next one too. Nowhere Boys premieres 6:30pm Thursday ABC3. Caught up with this last Sunday- fantastic stuff! Watched on catchup with 11 year old son and we both thought it was terrific. It’s great to have a strong story with male leads. Thanks for the heads up David as we would have missed this. Watched this with my daughter last night and enjoyed it. Family entertainment doesn’t have to be cheesy. Good one ABC3! Wow David, you’ve even got me interested in this show (and I am way off target as a 63y old grumpy old dyke). As you said it is great to see a production made with male leads especial teen boys as this seems to be a forgotten part of TV around the world. I am not the target audience either but I am looking forward to watching this. All reviews are positive.